I generally think of myself as kind of dorking along. I run sort of cloddily, I run into things, I wave my hands around a lot when I talk, and I just kind of blunder my way through many things I do. Take beekeeping. I can't keep my smoker lit, not to save my life. So I do the bees, but I'm not great at them. A lot of the time I open a hive, and think, "What is this?" But I did something very cool today. After watching them zoom in just loaded with pollen (the eucalypts are blooming in the hills), I wondered how the hives were doing since the look-see I did the other day. Generally, I suit up completely when I play beekeeper. But I just wanted a little peek. 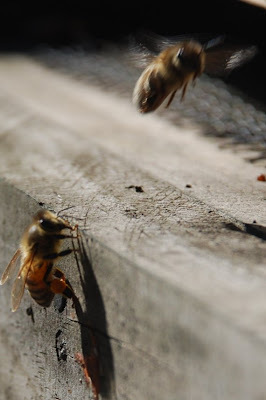 Soooooo, I just tiptoed over behind the first hive, and lifted the top up barehanded about 2-3 inches. Just enough to see the girls on the top of the frames. Not enough bees to put a super on top -- they're just starting to move up there -- but they're in both boxes. Next hive didn't look so fantastic, so I will go in more fully in a week or so to evaluate. But no stings, no fuss. I felt kinda like a rock star. And the kids and I started our Trails Challenge today, with a short lakeside hike, which also was pretty cool. We'll see if my enthusiasm holds all year 'long. I can't even finish a run -- I'm walking easily a third of each one, and plodding in between. I don't know why I bother, except if I keep doing it, I assume that "running" will return to my running. did not get a chance to off their sister chicken. 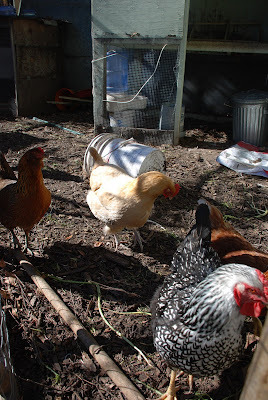 They managed to de-flesh the back of her neck pretty horrifically, but just before I was deciding that I couldn't keep her in the isolation coop and was going to have to move her on to the crock pot, a friend told me about someone who wanted a pet chicken to hang with their solo hen. Yippee! One less death at my hands, and one less old hen to feed. Hooray for kind hearted folks. 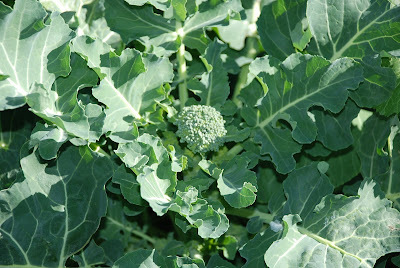 I'm growing the world's smallest broccoli. In order to redeem these vegetables, I'm going to have to eat the leaves in stir fry and cut the stems up and use them to eat dip, or something. Too bad I haven't much of an appetite these days. Except for kale, the one vegetable that is making me smile. 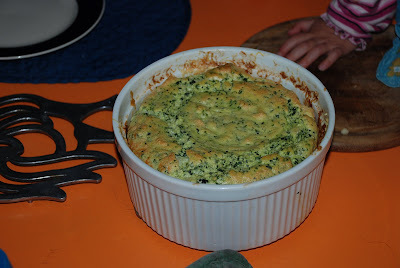 I made a kale soufflé the other day, even though when I was trolling around the internet for recipes the only reference to "kale soufflé recipe" I saw suggested that it would taste foul and therefore no one would wish for such a thing. Well, for a first time ever making one of these puffy marvels, it tasted great. But I love me some Lacinato kale. 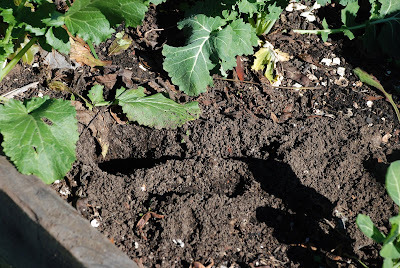 Something's been digging in my unfinished garden. I just figured out what to do about it tonight, but I'll do it tomorrow, after another round of digging, no doubt. It may be too late to save the six cabbage transplants. 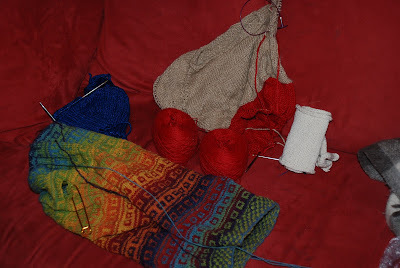 And instead of finishing any knitted project, I just have four in various stages of completion, being ripped out and redone, or languishing. 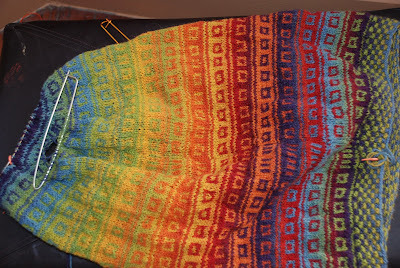 This doesn't, of course, count any projects half done packed away (you know who you are, cotton throw and sock pairs). Blue thing is a walking hat, oatmeal and red disappearing into the couch is a top down raglan for Thing 3, the Kauni is awaiting a day I feel strong enough to rip out three rows to redo -- I may never finish the neckline, never, I tell you, and the thing masquerading as a roll of toilet paper is the secret so far design that I have to consult with my buddy about tomorrow. Humph. I'd like to finish something but that would mean, you know, knitting. I'm sitting on the porch, grading papers while I'm watching the rain come down. We so need the rain (actually, we need snow in the snowpack for next summer), and it means I don't have to get out and water the vegetables. This morning, I considered staying in bed and not running. I'm not happy about my return to the streets -- feels like I'm carrying bags of rocks and I'm feeling old-lady and out of shape. But in a move of mind over emotion, I figure that running is probably a better choice than not running. So out I go. Even when I have to stop and walk, I'm making forward progress, mostly. I'm trying new routes -- the beach, the street, the main business drag -- and the route isn't the problem! The months of illness were much more of a setback than I knew apparently. I long for the feeling of running when it felt good, when I was happy in my body and light in my soul, feet slapping along. At least I'm not coughing now. But anyhow, I don't have to decide whether or not to run tomorrow in heavy rain, since I listened to my "go run" self this morning and did it in light. Tomorrow I guess it's situps and pushups. I just haven't felt chatty lately. I have been knitting a lot, though. Well, a lot for me. What that really means is that I've been starting a lot of things. 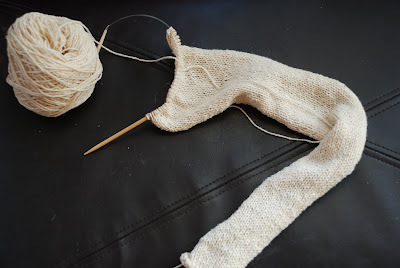 Up to the neck steek on the Kauni Cardigan, but I'm aware that the sleeves are going to feel like something of a slog. Maybe I'll finish the bands first, just to have them out of the way. Or not. Standard top-down raglan for Thing 3. 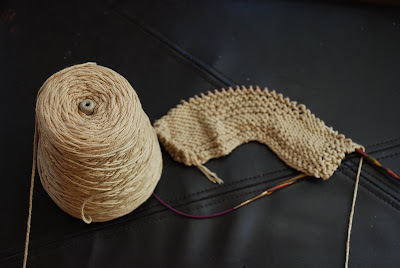 Warm, soft alpaca, and I'm planning colorwork on the body and sleeves. A last-minute gift, with lovely fancy soap. Good to have organic cotton in the stash. And my very first design, for my friend's yarn store. I think it will be pretty and I'll post a link to the store when the pattern is all done (rather than mostly in my head). 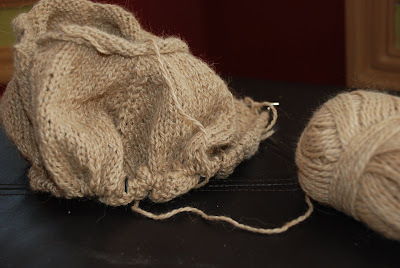 I'm enjoying the Silky Wool a lot, both in terms of texture and weight. Nice yarn. My friend says they're selling a lot of patterns and I can add "designer" to all of my labels. Snort. Leaving Wednesday for a week at the in-laws. Except for the gift, which has to be done by the time we arrive, the rest will probably go along for entertainment for me. Maybe I'll actually finish some things.